Standing on the sidewalk outside a small, three-story house on Paca Street, Father John Kemper, S.S., raised one hand and dangled a long, old-fashioned key that looked like it could unlock a treasure chest. 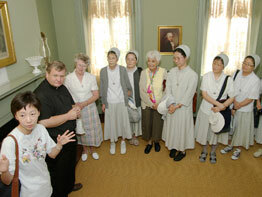 The Sulpician priest explained to a group of about 20 visiting Sisters of Charity from South Korea that the key was one of the original ones St. Elizabeth Ann Seton used to open the door to her house when she lived in Baltimore at this very residence in the early 19th century. Handing them the key, Father Kemper was greeted with a chorus of “ooohs” and “ahhhhs” as the women passed the relic from one sister to the next. The Korean sisters trace the origins of their Pennsylvania-based religious order to the Sisters of Charity of St. Joseph’s, which St. Elizabeth started in Baltimore in 1809. They made a pilgrimage to the historic site Aug. 8 after attending a general chapter meeting of their order in Greensburg, Pa. The Korean sisters are among a new wave of pilgrims visiting St. Mary’s Spiritual Center and Historic Site for the first time as it celebrates the bicentennial of the arrival of St. Elizabeth and the dedication of the historic St. Mary’s Seminary Chapel. St. Mary’s Spiritual Center and Historic Site includes the Mother Seton House, St. Mary’s Seminary Chapel and a center for spiritual instruction. St. Elizabeth came to Baltimore in 1808 at the invitation of Archbishop John Carroll to open the first Catholic school for girls. She arrived during the dedication of the newly built seminary chapel and it was in that chapel where she later professed her first vows. St. Elizabeth relocated her school from Paca Street to Emmitsburg a year after her arrival to Baltimore. Throughout her ministry, the Catholic convert and widow promoted the free education of poor girls, which was a precursor of the Catholic school system in the U.S.
Other historic figures are also associated with the site. They include Mother Mary Lange, who worshipped in the chapel. Mother Lange founded the Oblate Sisters of Providence as the first religious community for African American women and started St. Frances Academy in Baltimore to educate the children of slaves and former slaves. St. Mary’s Chapel and Mother Seton House are both National Historic Landmarks. Father Kemper believes increased visibility during the bicentennial will lead to a 20 percent increase at the site, which normally averages about 2,000 visitors annually. “We are trying to be more intentional about getting the word out about this historic place,” said Father Kemper, noting that invitations to visit the site have been sent to Catholic schools throughout the region. 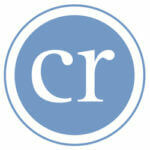 “We’d like to heighten awareness on how important it is in the history of the church in America,” he said. Visitors often describe the site as a peaceful oasis in a bustling city, he said. Ground has been broken on a $3 million visitor center that will accommodate tour groups and provide educational programs, Father Kemper said. The visitor center is expected to be completed by next summer, and the Sulpicians have launched a capital campaign to help pay for the project. Sister Saehyang Oh, S.C., provincial leader of the Korean Province of the Sisters of Charity of Seton Hill, said it was inspiring to realize that her order educates nearly 3,000 students in Korea alone, and it all started with just a handful of students who studied with St. Elizabeth in a tiny house in Baltimore. “Being here helped renew my zeal,” said Sister Saehyang.